I’ve been eating a lot of sweet potatoes lately in an effort to switch things up a little. I’m trying to come up with different ways to serve them because The Stud Muffin is a meat and regular potatoes kind of man. When I put sweet potatoes in front of him, he’s expecting a turkey and all the fixings to accompany it. Don’t get me wrong, I love regular potatoes, but they don’t love me. I feel a bit sluggish after eating them. The only time that I don’t is when I’ve made potatoes Au Gratin, which includes lots of cheese, cream, bacon, onions and butter. If I put enough protein in a potato dish, I don’t feel like a sloth the next day, but a girl can only eat so many cheesy loaded potatoes. Trust me, I know! I have a tasty pork tenderloin recipe I’ll be sharing soon and it has a maple-Dijon sauce that is really tasty. It got me thinking- I wonder what if this combination would taste good mixed into mashed sweet potatoes? Surprisingly enough, it tastes pretty darn good. Because TSM doesn’t care for sweet potatoes much I knew I’d have to make a savory-sweet version to get him to even try them. He’s so sweet. Even though sweet potatoes aren’t on his list of likes, he said that they “weren’t bad”, but did mention that doesn’t care for mashed sweet potatoes at all. The fact that these got a “weren’t bad” was high praise in my view because I know he feels about sweet potatoes and I know he thinks they’re too much like baby food. 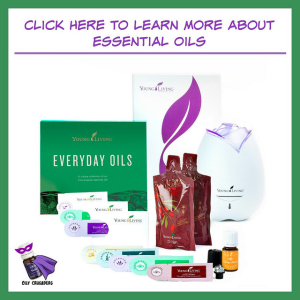 I am a little nervous sharing a recipe that one of us didn’t love, but I know there are many different palates and tastes out there, so I’m hoping you guys will like this as much as I did. I also know that if I would have shared all the recipes that only one of us liked I’d have 50% more posts on this blog than I already do. So tell me, what is your favorite way to eat sweet potatoes? 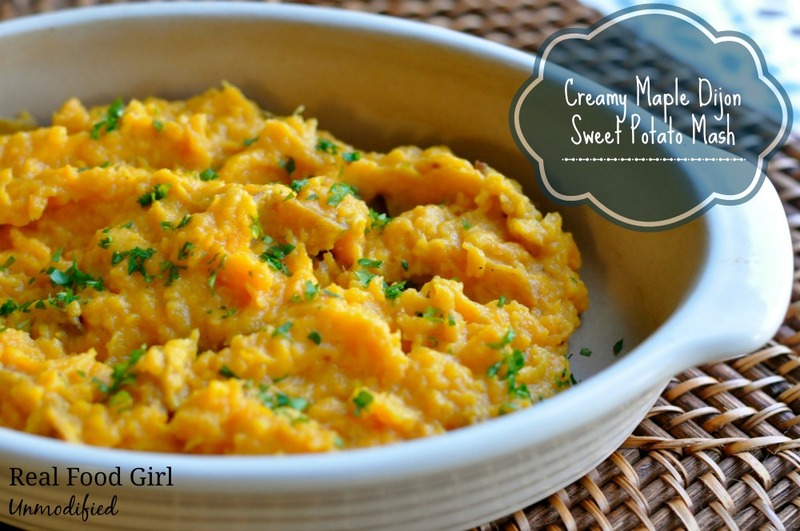 Mashed sweet potatoes with maple syrup, cream, and a touch of Dijon mustard. In a small bowl combine the maple syrup, Dijon and the balsamic and stir to combine. Set aside. In a large pot filled with cold, salted water add the diced potatoes and bring to a boil and cook until a paring knife stuck into the center of a potato releases quickly. When potatoes are finished, drain them and set aside in the strainer/colander, and add 1/4 cup cream (to start) to the hot pot, and the butter. Return it to the burner (heat off) to warm slightly. Add the potatoes to the milk and butter and mash them with a potato masher (or hand mixer) until smooth and creamy. Add salt and pepper to taste. Add the maple-Dijon sauce and stir to combine. Taste- adjust seasoning if necessary. We roast them cubed with beets, onions, carrots after a quick toss with olive oil and dried herbs. My wife is the true sweet tater enthusiast though and her favorite preparation is simply baked whole and served with a pat of butter and a shake of cinnamon. 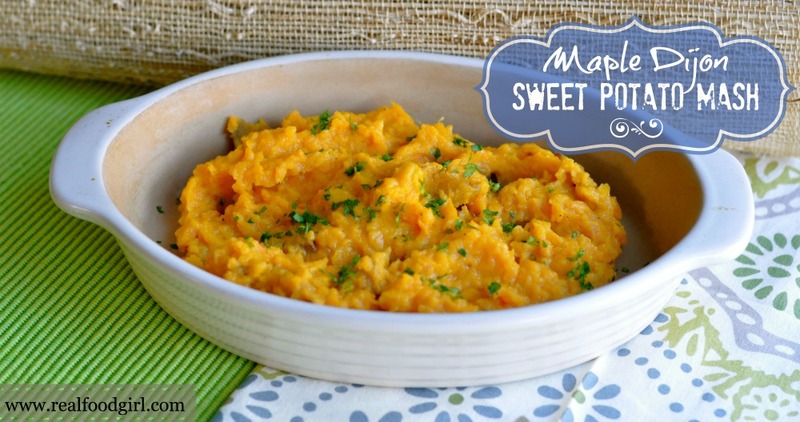 I have been trying to add sweet potatoes to our meals more often. So far, I have mainly been oven roasting them. I will try your recipe next time I rotate them into the menu. I’ve been trying to add these into the rotation more often, also. I really enjoyed this recipe. 🙂 Let me know what you think. This looks divine! I’m so curious about the mustard. This one I’ll have to try! 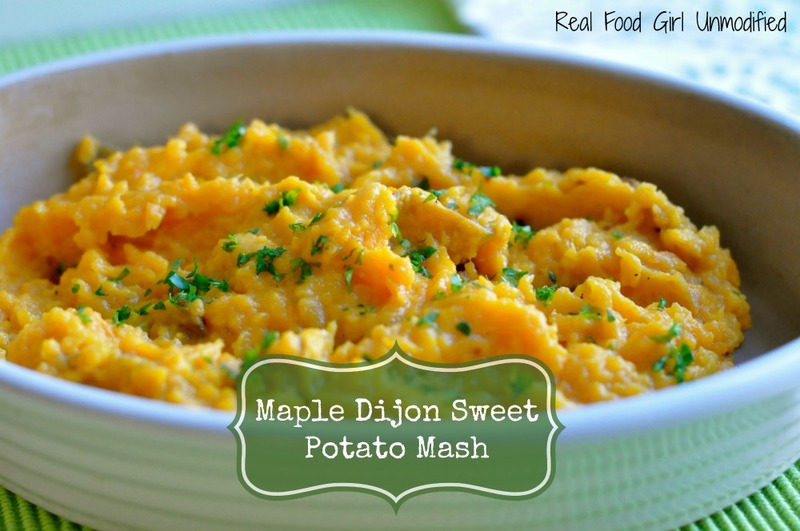 I’m not a huge fan of mustard, but with the maple syrup, and the sweet potatoes, it’s yummy! This looks delicious! Sweet potatoes have been in our CSA basket every week lately, so we’ve been eating lots of them. Ready for a new recipe. 🙂 I think my daughters will love it! Thank you! Oh cool!! Yeah, I was ready for something new, too. So I hear you! This looks easy enough to make and super tasty too. Thanks so much for the recipe! !